Ultimate Boot CD 5.3.8 | Linux DVD Shop - UK Linux Shop supplying Linux on CD, DVD and USB with Free UK Delivery, 24Hr Dispatch. Ultimate Boot CD contains a collection of software for testing, benchmarking and fixing PC issues. This massive collection of software includes tests for CPU, Memory and Peripherals. Loads of tools for hard drive cloning, repair and partitioning plus NTFS tools. 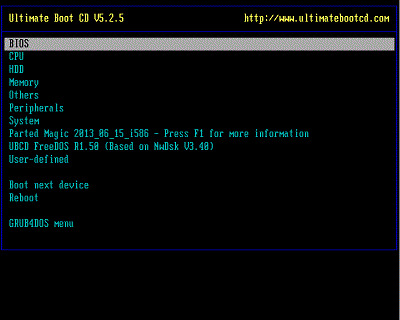 There are many boot options including Basic Linux and boot managers. Plus there are tools for hard drive diagnosis, data recovery, disk wiping, system information, virus removal, and much more. A great all round CD, so useful to have for any PC issues you may have over time.